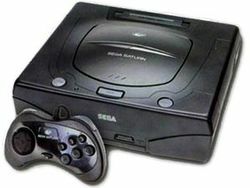 Launched in Japan on November 22, 1994, the CD-based Sega Saturn was the second-last home console to be released by Sega before their departure from the market, and its commercial failure is largely blamed for the company's eventual separation from non-arcade hardware. Although technically very advanced, the Saturn's complex architecture made developing games for the console extremely difficult, which caused most third-party developers to opt for the more straightforward PlayStation. Difficulties which arose when attempting to condense (and therefore cheapen) the intricate hardware also caused problems for Sega when it came to price cuts, losing further consumer interest. Notably, the Saturn was released in the US and Europe four months ahead of schedule, following a PR war between Sega's representatives and Sony's. Unfortunately, the Saturn's high $399 price didn't compare well with the announced PlayStation launch price of $299. "SegaSaturn.co.uk" – A very active online community and information point for all things Sega Saturn. Pages in category "Sega Saturn"
This page was last edited on 26 April 2015, at 01:47. This page has been accessed 20,942 times.